Residential dumpsters are designed to hold all of the debris and waste material created from the result of renovation, remodeling, cleaning, and moving. You can peacefully start your household projects without worrying about the waste material. Compile all of your junk in one, easy to use, residential dumpster. The versatility of residential dumpsters give homeowners the ability to place the container in hard to reach areas. This give you the ability to accomplish those difficult tasks. Start your project sooner, getting you to the finish line quicker. When you get the chance to remove the junk that has been accumulating and your trash can at home won’t suffice, give us a ring. We deliver directly to your door and pickup within 24 to 48 hours of request. A residential dumpster is ideal for all do it yourself projects. 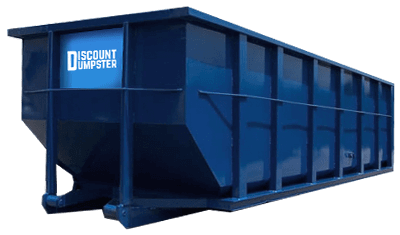 With a large variety of sizes Discount Dumpster will be here to help. Residential dumpsters are designed to hold all of the debris and waste material created from the result of renovation, remodeling, cleaning, and moving. You can peacefully start all of your household projects without worrying about the waste material because it will be compiled in the residential dumpster rental. The versatility of residential dumpsters give homeowners the ability to place the container in hard to reach areas so you can accomplish those difficult tasks. Having the ability to dispose of all of your junk in one place will move your project along, getting you to the finish line quicker. When you get the chance to remove the junk that has been accumulating and your trash can at home won’t suffice, give us a ring. We deliver directly to your door and pickup within 24 to 48 hours of request. With roll off trucks running 6 days a week we are able to deliver a residential dumpster rental Monday through Saturday. Availability ranges from same day delivery up to 30+ days in advance. We offer rush service to most locations and will be sure to deliver on time. Rental periods vary based on a few scenarios. The most common residential dumpster rental period is 10 days with the rental period starting the day after deliver. To get specific rental periods for your jobsite, give us a call. The most common sizes which are rented to residential homes are the 10 yard, 15 yard, and 20 cubic yard dumpsters. With a lower sidewall these residential dumpsters allow for easy disposal over the top. Residential dumpsters are good for roofing waste material, tiles, shingles, and floor material, dirt, yard debris, moving out stuff, home material and all general household junk or waste. Renovating a room in your home or taking on a full remodel can be a large project to take on. While you focus on making your home new and improved we will haul the old away. We make the process simple by delivering the container directly to you, you fill it up, and we haul it directly to the dump. Creating a seamless process so trash is the least of your worries.